Cambodia’s forests are a vital resource for the vast majority of the country’s population, 80 percent of whom live in rural areas and depend on small-scale agriculture for their survival. However, forested areas have been disappearing at breakneck speed, with studies reporting that Cambodia has the fifth-fastest rate of deforestation in the world. In the early 2000s, the Cambodian government began issuing Economic Land Concessions (ELCs), a long-term leasing system designed to promote large-scale agricultural development such as sugar and rubber plantations. Instead, ELCs became a way to cover up illegal logging operations targeting specific species such as rosewood. Much of this timber is smuggled into China to meet the voracious demand for luxury hongmu furniture, long considered a status symbol for the country’s growing upper middle class. In a country still recovering from the atrocities under the Khmer Rouge, ELCs became a new form of oppression by displacing poor farmers from their only source of livelihood—their land. Leng Ouch was born to a poor family of farmers in Takeo province, about 30 miles south of Phnom Penh, shortly before the Khmer Rouge came to power. During the authoritarian regime, Ouch’s family moved from forest to forest, foraging off the land for food and medicine for survival. In 1980, a few years after the Cambodian civil war came to an end, Ouch and his family moved to Phnom Penh. With his mother suffering from mental illness and his father working long hours as a pedicab driver to support the family, Ouch was largely left on his own. He made arrangements to enroll at a local school, where he cleaned classrooms and helped teachers in exchange for his education. His father’s earnings were barely enough to make ends meet at home, so Ouch scavenged the streets to find paper to do his homework. Despite the odds, Ouch persevered and excelled in his studies. He won a scholarship to attend law school and began working with several human rights organizations, a path he chose to help the poor and uneducated stand up for their rights against government abuse. Recalling the forests that sustained his family and countless others during the Pol Pot years, he founded the Cambodia Human Rights Task Forces (CHRTF), and turned his attention to illegal logging and land rights. In the hopes that global attention would force the Cambodian government to change its ways, Ouch sought to expose its role in illegal logging to the international community. But in order to do that, he needed to gather and document proof. Ouch went undercover to gather evidence of illegal logging activities, posing as a laborer, timber dealer, driver, tourist, and even as a cook. 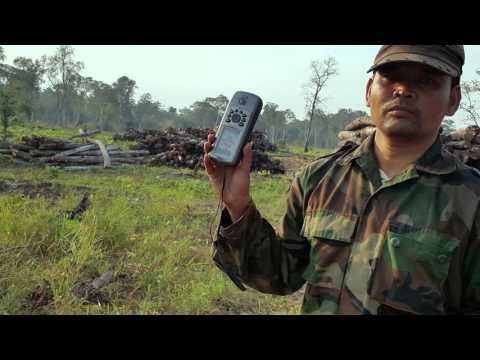 He documented the illegal operations of Cambodia’s biggest timber magnate. 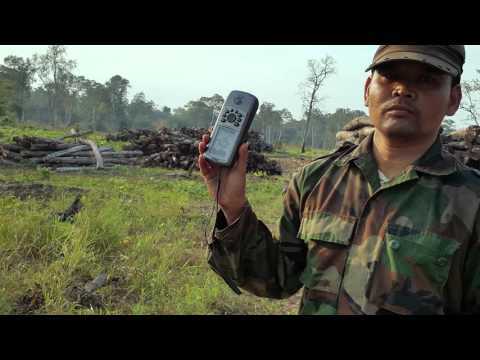 He then publicly released the photos and video footage he gathered, revealing how ELCs were used as a cover for illegal logging and exposing criminal collusion between timber companies and government officials at all levels of power. Ouch’s outspoken criticism of the government put him at enormous risk, in a country where environmental activism is dangerous—sometimes even deadly. Chut Wutty, an environmental activist and Ouch’s former colleague, was brutally murdered in 2012; last November, a park ranger and police officer were gunned down while patrolling forests for illegal logging and poaching. Ouch has had to go into hiding at various times, and his family has been intimidated by military police. In 2014, as a result of growing discontent among Cambodians and increasing scrutiny from the international community, the government canceled 23 land concessions covering 220,000 acres of forest. This included two ELCs that had been granted inside Virachey National Park—an area of rich biodiversity with federally protected status. With hundreds of thousands still bereft of their land and livelihoods, Ouch’s work goes on. He’s working to stop the government from issuing any more forest clearing licenses and get the logging companies to return the land to the government for registration to its rightful owners. He’s also working with a team of attorneys on international policies to prevent illegal logging. Sign the petition to demand that the Minister of the Environment save Cambodia’s embattled forests. Join Ouch’s organization, the Cambodia Human Rights Task Forces (CHRTF) and learn how you can help preserve Cambodia’s treasured forests.